It doesn't look real, I even thought…CANDY!! Yum!. The different layers are formed by algae (green) and sediments (yellow, brown), or by a rapid melting and freezing (dark blue). This photos were taken by Oyvind Tangen, 62, a sailor on board the research ship G.O. Sars in the Antarctic ocean, and by Leif Nøttestad. 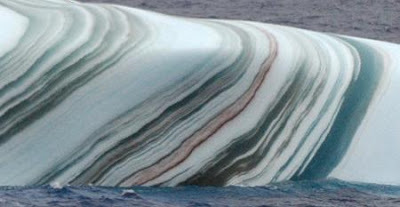 Staring at it for a while makes me hungry…Normally an Iceberg would look like this.. Most appear white as a result of the tiny bubbles trapped within them which scatter light in every direction. 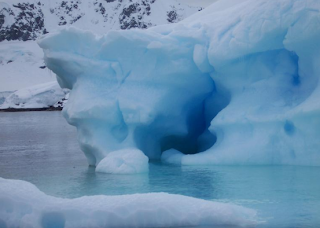 However, if the bubbles are squeezed out, or if part of the iceberg melts and quickly refreezes, it can appear blue. Be it stripe or not, nature is truly AMAZING!!! Physical world of knowledge is always so deep, fascinating.